October 16, 2015 was a momentous event for the further development and promotion of draughts-64 in the World. 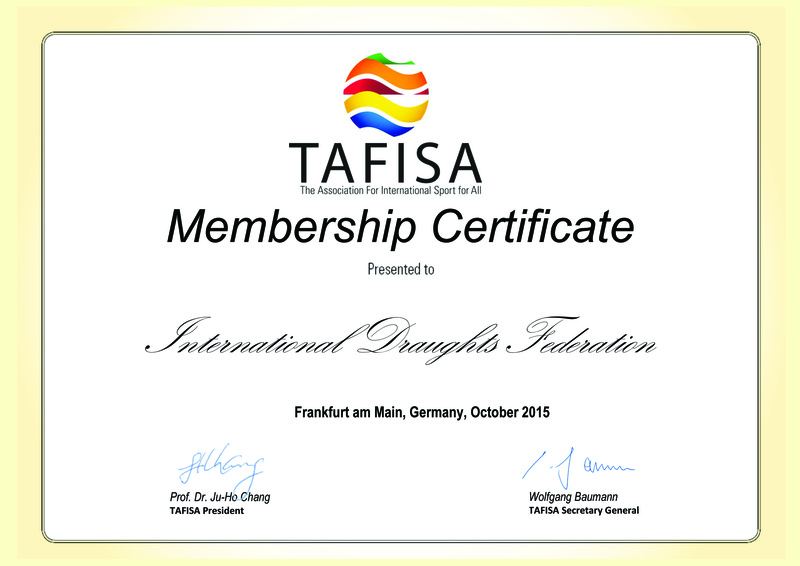 The International Draughts Federation (IDF) has become a member of TAFISA, the World’s leading organization in the field of sport for all. Delegates to the 24th World TAFISA Congress in Budapest unanimously voted for this decision. The organization officially recognized by the International Olympic Committee, and actively cooperates with the IOC, the United Nations, UNESCO, the World Health Organization. Today the TAFISA composed of more than 250 members from 150 countries of all continents. Congratulations to all that the draughts-64 entered the world of sports big family! Furthermore, I would like to note the success of the World Championship in draughts-64 among men and women (Russian and Brazilian versions). The competition, held in St. Petersburg in the beginning of October, attracted a record representation – 43 countries from 4 continents, the prize fund amounted to more than $ 60,000. Unfortunately, the success of draughts-64 did not become the success of the draughts movement. October 11 in Izmir, the FMJD General Assembly adopted a discriminatory statutes which artificially fixing priority of draughts-100 within the FMJD and significantly belittle the status of other types of draughts inside the FMJD, that breaks all the accepted norms and principles of sports. We will not tolerate the fact that somebody are trying to make the draughts-64 a second grade game. Over the past three years, draughts-64 come a long way, and has achieved almost the same position as the draughts-100 in the result of 70 years activity of the FMJD, and in many positions draughts-64 superior draughts-100. In full accordance with the FMJD Statutes, the Section-64 (section 64 Russian / Brazilian) General Assembly adopted the International Draughts Federation (IDF) as a legal entity of the Section-64 in response to the repeated statements by Harry Otten that FMJD is the federation for draughts-100. We did not seek to separate and wanted to work within the FMJD, but on an equal basis, as was enshrined in the FMJD Statutes. We have repeatedly offered to the FMJD Board various options for mutually beneficial cooperation, but they were simply ignored. Fragmentation of draughts-64 into separate sections, forcible deprivation of their international status, as enshrined in the new FMJD statutes and internal regulations, unacceptable to us. In this regard, Section-64 (FMJD section 64 Russian / Brazilian), exits from the FMJD and will continue to operate under the brand of IDF. From now on, only the International Draughts Federation holds all the legitimate World and continental championships in Russian, Brazilian draughts and other varieties of the game. We are dedicated to peaceful parallel coexistence with other international draughts structure – the draughts-100 federation FMJD – subject to the principle of mutual respect. We will not tolerate hostile action against the IDF as from organizations (attempts of holding World and continental championships in kinds of draughts, which are developing by the IDF), as well as by private persons (participation in the illegitimate championships). Currently, 49 national federations are the IDF members. We are the organization, basing its work in accordance with the democratic principle of freedom of self-determination. Any IDF member federation, not wishing to take part in our international competitions, receive benefits and preferences for their players, may submit a statement to the Federation Board to withdraw from the IDF. At the same time we are happy to accept the membership of new countries that are interested in the development of all kinds of draughts, and not just the Dutch national game of draughts-100. In connection with the fact that the draughts-100 is a priority for the FMJD, we will do everything possible to unite the multi-faceted and multi-cultural draughts world under the auspices of the IDF, to cooperate with various international organizations, and to work for the IOC recognition of the separate sport “Draughts-64”.